I’m all for recycling, so when a close friend asked me to make some bunting from an old, tired cushion to brighten up her daughter’s bedroom, I was more than happy to. The cushion had originally been made from a lovely pink, spotty fabric left over from the curtains in the room. It was just a bit unloved and she wanted to add a touch of colour to the white walls. 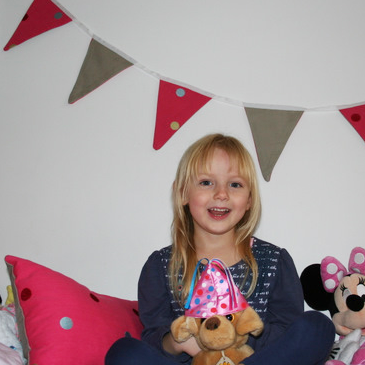 The small, soft cushion and colourful bunting I made have really brightened up the room, pulled the scheme together and put a smile on a beautiful little girl’s face. It’s amazing what a bit of recycling can do!